2.Available in 1t, 2t, 3t, 5t and 10t capacities. 3.Durable baked enamel paint protection. 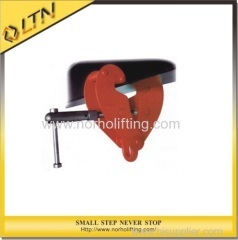 4.Bottom eye allows simple attachment of a chain block or lever hoist. 6.Proof tested at manufacture is 2 times the working load limit. 7.Manufactured and tested in accordance to EN & AS4991. 8.Super-quick adjustment to any girder width in range.